Following on from my successful Wild Light photography workshop in County Kerry last week, I will be leading a photography tour in County Clare in 2017. There are two remaining places left on the workshop at the time of posting this, please contact me for availability. Outline details of the County Clare photography workshop are on the website. Please click here. We will be based in the attractive village of Ballyvaughan, pefectly situated for exploring this incredibly beautiful area with easy access to many amazing locations including the Aran Islands and The Burren. The full tour itinerary will be published on the website soon. Poulnabrone Dolmen, The Burren, County Clare. Just one of the many amazing locations we will visit on our Wild Light Photography Tour of County Clare with Steve Walton, 30th April-6th May 2017. 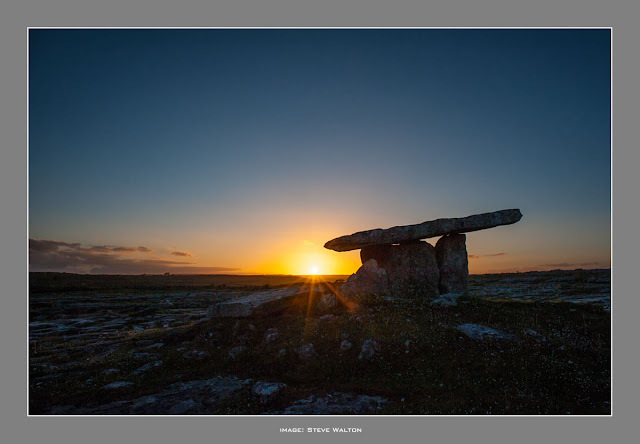 Poulnabrone Dolmen at Sunset by Steve Walton.